In this category you find glitter and leaf textured jewellery. Cute magenta gold sitting cat pendant. The pendant has been handcrafted with polymer clay and micro fine glitter. Cute standing cat pendant in purple and gold. This pendant has been handcrafted with polymer clay and micro fine glitter. 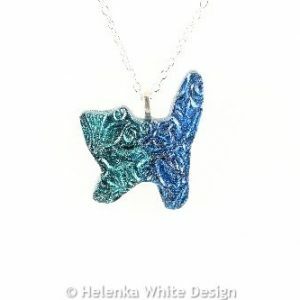 Cute standing cat pendant in green and blue. This pendant has been handcrafted with polymer clay and micro fine glitter. This cute lying purple and copper cat pendant has been handcrafted with polymer clay and micro fine glitter. Sparkly lilac and gold heart pendant made with polymer clay and microfine glitter. Sparkly magenta & gold heart pendant made with polymer clay and microfine glitter. 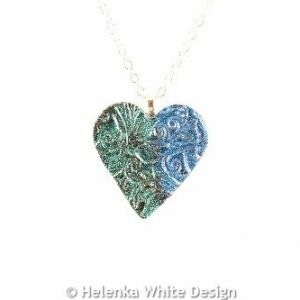 Sparkly green & blue heart pendant made with polymer clay and microfine glitter. Sparkly purple and gold heart pendant made with polymer clay and microfine glitter.